"The work was professionally done, accompanied with excellent advice before and after. They were accurate with their estimate, and the results were beautiful..."
Lawn diseases are fairly uncommon in Mississauga. When they do strike, they are unsightly and demand immediate attention. Most lawn diseases are a result incorrect watering habits and fertilization. If you follow the basic principles of lawn care, you can avoid many problems. See our frequently asked questions for information on lawn care tips. 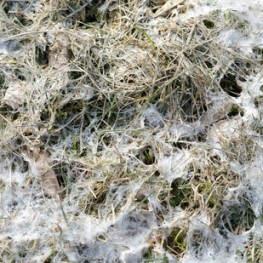 There are two distinct types of snow mold: grey “Typhula Incarnate” and pink “Fusarium nivale.” Characterized by a fluffy residue that moves with the edge of the melting snow. Be sure to do a proper fall clean up and remove all leaves and debris. Do not apply high nitrogen fertilizers late in the fall. Utilize proper mowing and watering habits. Break down slow melting snow piles on the lawn. Last cut of the season should be about 2 inches. Rake out infected areas and increase air circulation. Bag infected grass. Support spring growth with aeration and fertilization. As the name implies, dollar spot appears in summer during warm temperatures and creates spots ranging in size from 2 cm to 4 cm. The spots are brown in colour and are usually sink down ground level. Irrigate late in the mornings and allow excess moisture to evaporate. Mow grass to the optimal 3 inch height. Remove excess that that may prevent adequate moisture absorption and air flow. Fertilize in the spring with an organic, slow release, fertilizer that contains nitrogen. Overseed as dollar spot can kill the existing turf. Pleasant sounding name, but not a nice situation for your lawn. You can tell your lawn has fairy ring from the tell tale dark circles. These circles are caused by decomposing organic matter that produces an excess of nitrogen. This fungal disease is commonly associated with mushroom growth. 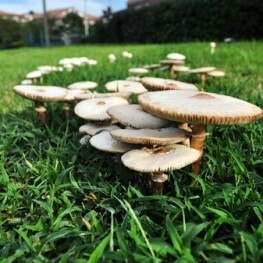 The key to preventing fairy ring is to eliminate the organic materials that create the growth. Tree branches, stumps, wood chips, tree bark and old lumber can create fairy ring if they somehow get into the soil. Aerate the infected area to reduce soil compaction. Keep thatch to a minimum. Supersaturate the area by poking deep holes with a garden fork and soaking. Overseed with a resistant seed variety such as bluegrass. This disease is more common in the spring, but can occur year round. It is recognised by its circular shape with healthy grass in the centre. 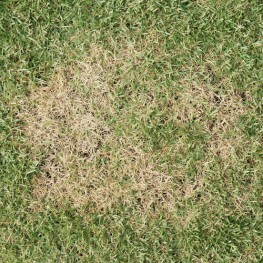 Grass in the centre of the infected area may be greener, due to excess nitrogen produced by the disease. The centre of the infected area may be sunken down to ground level. 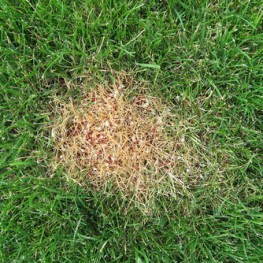 Necrotic ring spot is commonly found in newly sodded lawns, but can appear in all lawns, if the airborne spores are transferred from one location to another. Necrotic ring spot generally infects lawns that are being overwatered, or have poor drainage. Maintaining good watering habits is the key to preventing an outbreak. Always water the lawn in the morning to excess water has time to evaporate. Adjust sprinkler head zones to ensure irrigation is being evenly dispersed. Apply high quality, organic compost to the infected area to stimulate beneficial microbes in the soil. Pythium is generally found in cool-season grasses in warm weather, but can also affect warm-season grasses. 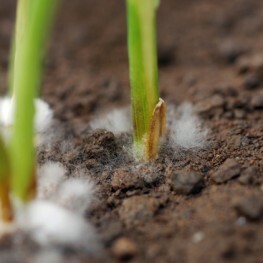 This disease is also known as cottony blight, because of the cotton like mycelium that can form on the infected areas. If optimal conditions are present pythium can progress rapidly. Pythium favours hot, humid conditions. When these conditions are present reduce watering, especially late in the evening. Avoiding excess thatch can also help prevent pythium from infecting your lawn. Utilize good irrigation habits and never water late in the evening.